Hardwood vs. Softwood - What the heck does that even mean? Hardwood vs. Softwood – What the heck does that even mean? We get nearly 100 calls a day from members of the community at-large that are curious about the difference between hardwood and softwood. Okay, admittedly, 100 calls a day is an exaggeration. But, we are frequently asked to explain what determines whether the wood is considered hard or soft. Hardwood, as implied by its name, is generally stronger and softwood is, well, softer. Interestingly, the density of the wood alone does not determine which category it falls into. 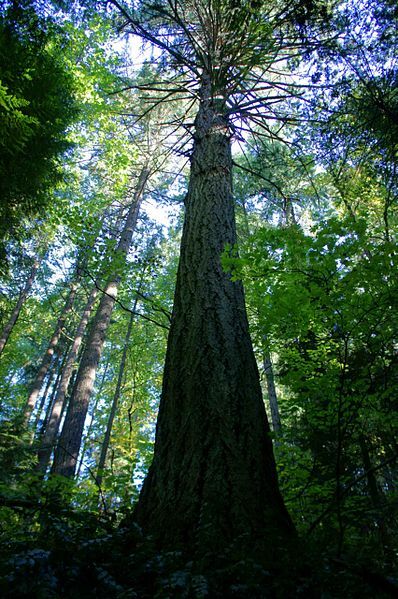 Softwood trees are usually gymnosperms and can be identified by their needles and cones. Evergreen conifers produce pollen and seeds within their cones and reproduce when the seeds either fall to the ground or are carried by the wind and germinate if the conditions are ideal. Other differences between the two types include growth speed and what each wood is best suited for. Hardwood trees grow slower whereas softwood grows faster. Hardwoods are most often used for construction, the production of furniture, and for wooden flooring; typically for projects that require a very durable source. Common hardwood trees include Maple, Mahogany, and Walnut. Softwoods are used for making furniture and projects that don’t need to be as long-lasting, such as doors. Additionally, they are the primary source for making paper and farmed to supply the demand for Christmas trees. Included in the softwood family are Pine, Douglas Fir, and Cedar. We have to admit we are pretty partial to Mr. Doug Fir. ArborPro NW has been the leading source of all things tree-related in the region for more than 20 years. Whether you’d like a certified arborist to help you distinguish hardwood from softwood or need assistance with pruning, emergency tree removal, or simply have a few questions on any topic related to caring for trees, we welcome your inquiry! Free estimates and expert advice are just a phone call away. We work in Portland, Oregon and all of the surrounding areas. You’re even welcome to call us 100 times!